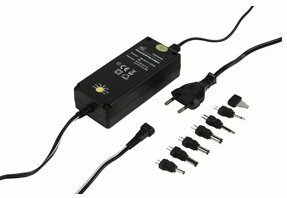 This is a universal AC adapter for European sockets (not suitable for UK plugs) and fits all Celestron telescopes with GoTo functionality. Do you want 2 or more? NOTE: You will need to set this adapter yourself with the switch. Celestron Telescopes run on 12 volts and 2.5 Amps. This means you need to switch the adapter to 12 volts. Very compact and highly efficient 36W adapter with 5-15 V output and LED indicator. 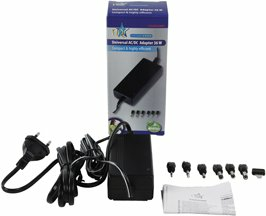 The 6 interchangeable power tips make this adapter suitable for many different devices. Well as David Roberts pointed out it doesn't seem to fit properly to my Celestron Skyprodigy 130. However it does seem to stay in place although it's somewhat to easy to accidently yank out the output plug from the telescope. So it does work, i tested my scope and it gets the power but it's easy to yank out. In my opinion, it gets the job done, so I'll keep mine. lots of different output plugs. I bought this to use with my 'scope which I bought at the same time, to be used close to a power point. However the business end will not fit correctly in the socket on the scope. It will fit in most other small electrical items and that is the only reason why I didn't return it.